Time to make a topic about this thing. 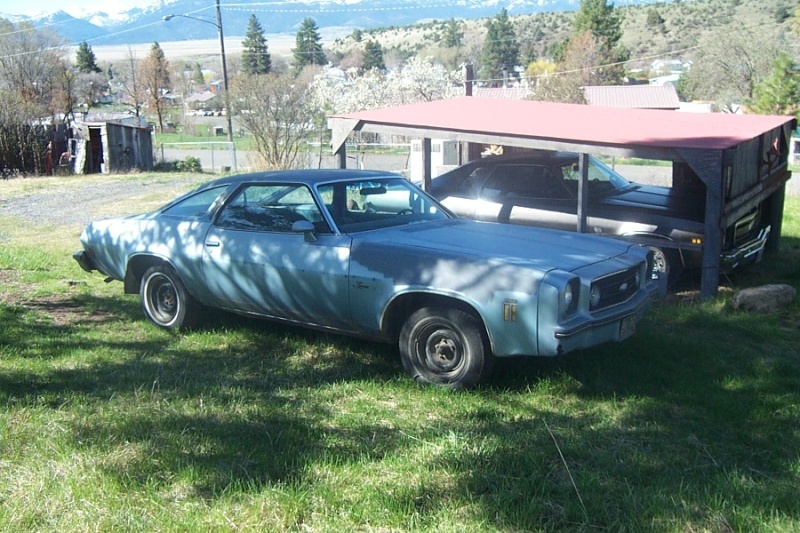 My '73 was obtained by a stroke of sheer luck. The previous owner of the car daily drove it around town and even through semi-decent roads out in the woods. I offered to buy it from him one time and he refused. In fact, nearly everyone did. Some thought it was a cool car, many others just wanted to demo derby it. One day, the guy goes out in the woods to hunt and his engine overheats. Car starts blowing white smoke everywhere - cracked head gasket. So in a fit, he sells it to his buddy for $100 who's just going to scrap it. His buddy also got it by sheer luck. 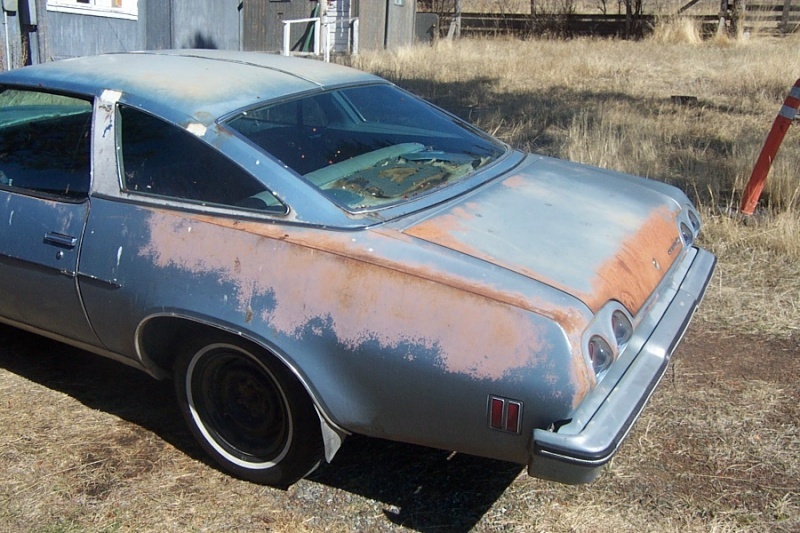 Another guy was less than a day from offering him $200 to buy it for a derby car. I can't even remember what brought that car up, but the guy who bought it from him just happened to come into my workplace the day before he was going to load it up onto a trailer and have it crushed. I told him I wanted the nose off of it but he told me I could have the whole thing for $300. Sold. The nose alone was worth that to me especially out here in the middle of nowhere. Not in terrible condition at all. Came with the 2bbl 350/TH350 combo, dash cap was in good shape, all rust was cosmetic and the vinyl top had long since torn away so it hasn't rusted through the cab. Lucky deal for $300! Just some minor sanding and priming to stop the rusting. I also removed the chrome. Since then, nothing terribly significant has taken place to the car itself to take pictures of, but parts are slowly being assembled on the side. This is going to be a unique build inspired by my want of a car that performs but also reflects myself, my personality, and simply something totally different than anything else on the planet. Warning: not everyone will like this. The 350 has been ripped out and the firewall is about to be cut apart and a wheel barrel mod will take place, giving me room to mount an engine farther back on the crossmember. Between the mount movement and the new engine mount location, this will place the engine back roughly 10 inches. Oh, and the engine is a Buick 401 Nailhead. I got a lucky deal off a guy who had one of these in a derby car and one of his a-arms sheered, rendering his car immovable and causing him to throw his flag before his nose took enough damage to hurt the engine. I scored this for $100. At first I was skeptical of a Nailhead. Until he offered to sell it to me, I'd never even heard of them. I'm typically a Chevy in a Chevy kind of guy, but some heavy research (several nights after work were committed to this) changed my mind. The plan is to install forged steel pistons to accompany the rest of the forged bottom end and turbocharge the set-up. With the characteristics of the 401, the build I'm doing, and looking at other builds online, I'm aiming for a 600HP build with grossly more torque - somewhere in the realm of 800 ft/lbs. The engine placement will not only allow for better balance, but ducting to improve aerodynamics and shoot a vast majority of the air coming into that huge mouth - which is overkill - over the hood in a streamlined manner. Cooling will obviously be upgraded greatly to compensate. Other body modifications include a 79 Camaro rear spoiler I've modified to fit the tail end just as DocLarry did on his Laguna at ChevyTalk. I'm also in the process of adding Trans Am fender flares to help air flow over the wells better and fender vents to relieve pressure from the engine bay. This is especially important because I also have an undertray with front splitter and rear diffuser fabricated from thick aircraft aluminum salvaged off an old Avion camp trailer. Looking to get a 4" cowl hood as seen in the Tech section which I'll modify with the outlet for the engine bay ducting. For the rear, I've got a Furd 9" sitting on a stand awaiting new gears, differential, and if I can find one I'm going to install the Hone-O-Drive Model 200 that bolts directly to the pinion carrier. Right now the nailhead is mated to the original ST400 (early TH400) but my end game is to install a built up 4L80E with all straight planetaries. I admit this is a stylistic choice because I love the whine of straight cut gears but it may also be that the straight gears resisting torque thrust may be an advantage with the nailhead's tendency to have a disproportionately high amount of torque. We'll get to the suspension and chassis details along with the interior and such later, right now I have no parts for this, all I have are ideas. The end game is to have a totally unique machine that is street legal but can race most events competitively. A pro-tour build, more or less. There are few competitive G3s out there. There are few competitive nailheads out there. There are NO nailheads in a G3 even trying. In the end the biggest thing holding this back is that I will not sacrifice comfort. No stripped panels and carpets, I want to be able to relax in this car and take it on trips when I want. That means some extra weight despite shavings. I'm shooting for 3200 pounds. There's also another feature I'm sure many guys here will hate. I'm sure very few of us have seen a "smart" muscle car. That is, a muscle car with a computer on board with all kinds of neat features. I've been developing an UltraHAL AI that will run basic functions on the computer for me so I need not distract myself with various systems manually. This includes stereo, Google Earth + GPS + radar detection, phone calls, instant voice messaging, a library of useful PDFs relevant to the car, and more. And before anyone gets any ideas about KITT, this isn't quite the same thing. The AI is programmed to "know" it's a computer in a car and does not act in human-like ways. 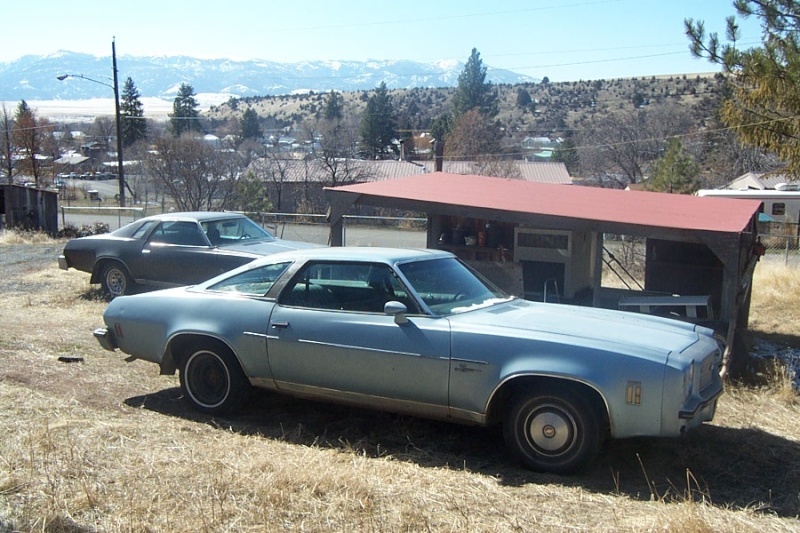 In fact it refers to itself as a '73 Laguna already and knows what it's capable of. Someday, I might make this an exhibition where others can ask the car about itself and the AI will explain itself to them. And we'll see where she goes from here. First item on the list is the firewall mod. This is pretty awesome. Both the history as well as your plans. You will have to keep this thread going. I'm real interested with following it. Especially if you don't mind if I integrate a few of your ideas into my car. I'm especially interested in the UltraHAL. The software I understand. It's the integration that has my attention. As far as your engine choice, I too am a chevy for your chevy kind of guy. But then, GM did kind of mess with their lineup around these years anyway - what with the corporate blue engines for all brands. I had forgotten all about the Nailheads. Lots of history there. I did a little research and got this from wiki. The last paragraph is the part I like. "The 401 cu in (6.6 L) 401 was Buick's big car and later midsized muscle car powerplant (relabeled '400', see above) of choice, and was found in the company's Skylark Gran Sport and Buick Wildcat, among others. As unlikely as it seems, the air cleaner for the engine is annotated with "Wildcat 375" "Wildcat 410" "Wildcat 445" these inscriptions indicated not the cubic inches displaced but the lb-ft of torque produced by the engine. The "Wildcat 410" was the 2-barrel carbureted engine that was standard on the 1962-63 LeSabre. The "Wildcat 375" was a no cost option on the 62-63 LeSabre that had lower compression to run on regular fuel (another Buick V8 had "Wildcat 375" written on its air cleaner but it wasn't a true "Nailhead", despite its appearance, it was the 4-barrel version of the 66-67 small block Buick 340). The "Wildcat 445" had a single 4 barrel carb. It was the standard engine on the Invicta, 1959-66 Electra, 1962-66 Buick Wildcat, 1963 Riviera and 1965 Riviera (the 64 and 66 Riviera models had a 425 in³ engine with a single 4 barrel carb. named "Wildcat 465" as standard equipment). These were also used as starter motors for the SR-71 Blackbird, mounted on a trolley." "In an effort to overcome the "restrictive" exhaust port design, Buick drag racing enthusiasts in the sixties adapted superchargers with a custom camshaft to feed intake air in through the exhaust ports and used the larger intake ports for exhaust outlets. Perhaps this feat of ingenuity, and the unusual appearance of the engine modified in this manner, also intimidated rival racers and added to the Nailhead V8 legend that lives upon this page of US auto history." I had often heard that rumor, but have never actually seen it applied. Good luck and cant wait to see lots of pictures. 77ElClassic wrote: This is pretty awesome. Both the history as well as your plans. You will have to keep this thread going. I'm real interested with following it. Especially if you don't mind if I integrate a few of your ideas into my car. Not at all, basically all of these ideas come from other projects in a way, I'm just bringing them all together into one car. I also did a ton of research on aerodynamics and Formula 1 innovations to find ways to make a brick more aerodynamic. It's never going to be able to punch through the air like an 80s Firebird might have, but I don't really care. UltraHAL is able to call up programs on voice command, for example if I say "Run Google Earth" then it will start the program for me. Google Earth can sync with a handful of programs that work with cheapo GPS units you can plug into the system via USB. This means you can see your car as an arrow on Google Earth as it's driving around the maps and can trace your route as you go, mark routes to get to places, and of course it lists businesses and cool stuff on its own. The appeal for me is that I can get in the car and just go. Google Earth will tell me where a lot of the cool spots are. If I find something I enjoy, I can add my own little marker on there. Also, Google Earth is compatible with a few programs that are associated with radar detectors. The software will record when the detector goes off and create patterns on Google Earth so it can tell you probable locations of speed traps and the like. UltraHAL has a companion program that will speak pop-up messages, so when a message comes up telling you something is nearby, be it speed trap or restaurant or whatever, your AI's voice will pop in to tell you what's going on. That way you don't have to worry about staring at your monitor which is exactly what I don't want. I just want to DRIVE and if something comes up it'll tell me about it. It's a LOT of work to get it to not act like a total goober, but once you get it straightened out it's a lot of fun. I've ran it in the Malibu for kicks on a laptop to test it out and I was impressed. As for the nailhead, it's an oddball and I had to rethink a lot of things. The reverse intake system works but isn't really necessary if you're going to run modern forced induction systems. What killed the nailhead was that it couldn't breathe at higher RPMs. However, forced induction will continue to cram air down its throat and overcome this. There's also talk that reversing the induction system can cause overheating issues when using it for any long amount of time and subsequently shorten the lifespan of the engine. Before they pulled the plug entirely, GM ran an experimental turbo 425. They knew what the problem was and were going to try to fix it. The results, if the reports are to be believed, are interesting. The Turbo 425 never came about because GM didn't offer an automatic transmission that would survive behind 700+ ft/lbs of torque. Got the interior stripped out, engine out, cut the crash bars out of the doors, just getting ready to cut the firewall now. Not positive yet how much room I'm going to have inside near the gas pedal, may need to create a hump there to allow comfortable use of the throttle.